“From the poor to the rich”????? How in Hell do you steal from somebody who has nothing? For that matter, _WHAT_ can you steal from a person who has nothing? 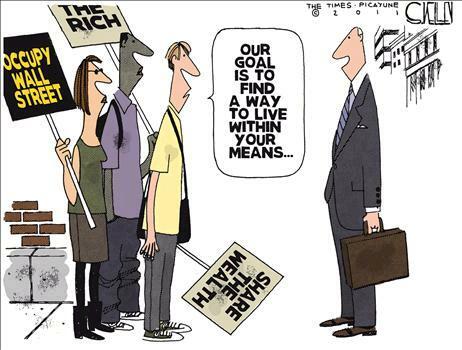 Any redistribution that takes from _ANYBODY_ to give to _ANYBODY ELSE_ is wrong! And why don’t they understand that the real thieves are the government and the union bosses and the fat, greasy, sweaty hollywood socialists like Michael Moore and Jeaneane(sp) Garafolo(sp)? Oprah gives away 300 cars. How about 30,000 Thanksgiving dinners? demand it to be paid NOW, yet when you owe others a debt, you demand mercy and forgiveness/cancelation of that debt? When the government owes them something or when they feel the government owes them something, they demand it be paid IMMEDIATELY (“When do we want it? NOW!”), yet they want their own consumer debts that they owe to others to be defaulted on and repudiated. What selfish, hypocritical, illogical ideas! Perhaps these Wall Street occupiers and the “Liberal Democrats/Progressives” who support them and their demands for consumer debt repudiation should reread the Parable of the Unrighteous Servant found in St. Matthew 18 in the New Testament. One of the things I loved about some of the Occupy Wall Street hippies is the demand they be forgiven their student loans. You should appreciate the irony here Dan. 1. Government gives money to Wall Street. 2. Corporations act as you’d expect and take advantage of it for profit. 3. Anti-capitalists rage at Wall Street. 1. Government gives money to education. 2. Colleges act as you’d expect and take advantage of it for profit. 3. Anti-capitalists rage … at Wall Street. Why sleep on the street when you don’t even have to leave the comfort of your own campus to protest the exact same kind of cronyism? I mean if they really believe the onus is on the people at stage 2 of this process to refrain from “greed”. Yesterday, I actually went to OWS to talk to them in person. I found many thoughtful people. They were all seemingly willing to engage in discussion with me and nobody (except for one cop) was rude to me. In fact we ended up finding much common ground and those who knew about libertarianism seemed to have respect for it. I came away encouraged. This is the song the West is singing on its way to decline – same song — sang in a few different variations by delusional useful idiot naives across the Western Hemisphere. The seemingly disparate upheavals that the Western world is going through: bubbles, crises, debt etc., are simply different facets of a Western world that is loosing its fundamental competitiveness and prosperity advantage against a much larger rising humanity of once oppressed people. The three billion once oppressed people who have finally woken up to some, albeit limited, economic freedom have no time or desire to wait and find out how the Western World’s experimentation with socialism will turn out. In economic terms they will simply take no prisoners. Especially amongst the once snobbish Westerners who took their wealth for granted and thought it would last forever no matter how much ex third world mandatory collectivism they adopted. The West has simply lost its way, so it’s economic crisis stems from its cultural crisis. Western voters, comfortable in their success, stopped fostering the very individualism that enabled the West to rise to the top of human prosperity – while at the same time three billion people of the once oppressed world took up reforms toward more individualism. Faced with the challenge of a rising emerging sea of humanity, the West is adopting the very collectivism rejected by its once failed competitors, It is thus reacting in textbook suicidal fashion. It’s too late to arrest the fall, much less reverse it. The West is now living the twilight of its once taken for granted dominance, their democracies in the declining embrace spiral of HopeNChange and Mitchell’s-Law. Attempting to stop voters from pressing the redistribution button at the polls is like trying to convince alcoholics to give up the bottle. Everyone knows the final outcome, but quitting is just so hard to do, one more drink and then I’ll stop. Americans are the latest western culture to take up drinking. The writing is on the wall… but it is now frightened westerners staring at the wall. You know nothing of these people. If you did you wouldn’t say such asinine things.